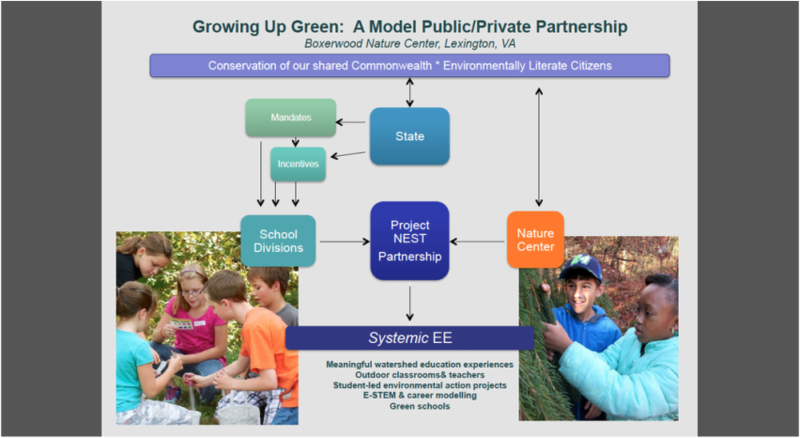 Invigorated by the multi-state 2014 Chesapeake Bay Agreement, the Commonwealth of Virginia has mandated all public school systems include environment-based learning in their curriculum. Lack of expertise and resources, however, currently hinder many school efforts across the state, as detailed in an official 2014 needs assessment. Project NEST enables our local school divisions to not only meet state expectations but in fact vastly exceed them. The holy grail of environmental education is systemic implementation: field-based learning that engages all students in at least one grade level across all schools within a division. 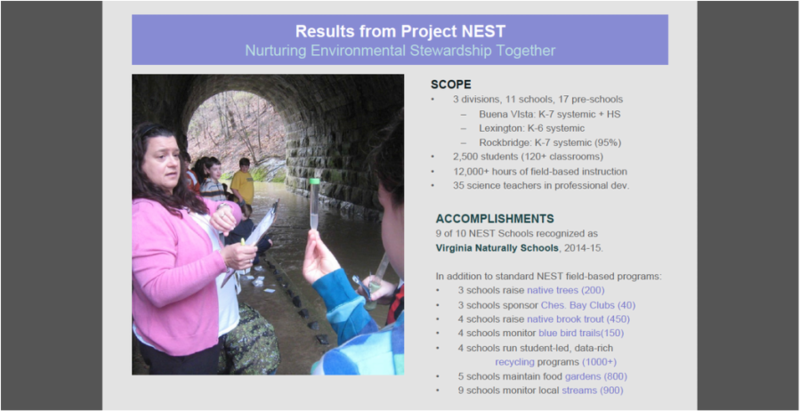 Unique among projects in Virginia, Project NEST achieves systemic environmental education across multiple grades and multiple divisions. The result: most Rockbridge area students participate in up to eight consecutive years of environment-based learning during their K-12 public education. Project NEST builds on a comprehensive nature-based programs with all seventeen preschools in our area. The nature connections continue year after year through elementary school and into middle school and beyond. Fifty percent of all students served by NEST qualify for free or reduced lunch. Our local school divisions face many financial constraints but they have made strong commitments to ensure equal access to NEST programs for all students. This long-term commitment is a hallmark of NEST. Project NEST supports academic goals of area schools through nature-based methods of instruction. These methods also result in additional benefits: green schoolyards, engaged communities, and empowered students. For the 2014-15 school year, the Commonwealth of Virginia recognized only forty-five schools state-wide for their sustained environmental education efforts. 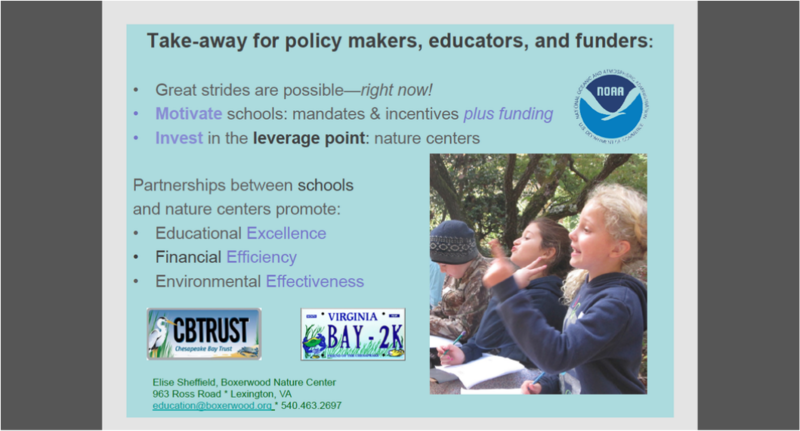 Nine of these Virginia Naturally schools were Project NEST Schools. Investing in nature centers as leverage points for systemic environmental education makes sense. A nature center focus on outdoor learning and thus brings energy and expertise to the task of helping schools juggling many other responsibilities. In terms of instruction, nature educators and classroom teachers each have unique areas of expertise. Working together creates a synergy, resulting in high-quality field-based/classroom-integrated programs that get students excited about learning. The synergy also boosts teacher skills, thereby further embedding a culture of nature-based learning within the school system itself. A nature center actively partnering with multiple schools also knows how to arrange and coordinate field programs efficiently and effectively. This capacity for multi-project management removes the barriers of time and know-how confronting many otherwise interested teachers and schools. Thanks to economy of scale, a pool of shared supplies (boots, probes, clipboards, nets, etc.) owned and managed by the nature center also solves a resource problem faced by many under-funded schools. A nature center with its own circle of contacts also enhances projects with additional pro-bono partners and professionals thereby further building capability within the system. Equally important, a nature center/school partnership results in positive outcomes for the environment: more schoolyard habitat, gardens, and trees, to name a few examples. In this win-win partnership, teachers and students have the wrap-around support they need to put their learning into action on behalf of a thriving world. What's not to love?